The earliest undisputed evidence of prehistoric art dates to the Upper Paleolithic, some 50,000 to 40,000 years ago (see Upper Paleolithic art). Visual art began with emergence of sculptures, beads and cave paintings of Europe, Africa, Americas and Australia in the cultures of Homo sapiens at around 40,000 years ago. Together with religion and other cultural universals of contemporary human societies, the emergence of figurative art is a necessary attribute of full behavioral modernity. There is, however, evidence of an emerging "preference for the aesthetic" among the Homo Erectus of the Lower Paleolithic (Old Stone Age) and the Homo sapiens of the Middle Paleolithic (Middle Stone Age) in the period leading up to the beginning Upper Paleolithic, from 200,000 to 50,000 years ago, in particular in the high symmetry exhibited by stone tools, often manufactured with much greater care than would strictly be needed to arrive at an operative hand-axe. 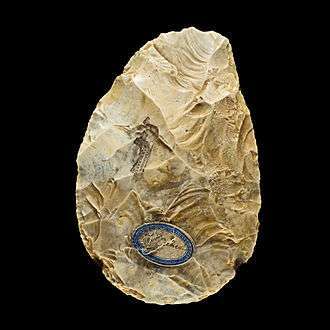 The earliest evidence of artistic activity, in the form of diagonal etchings made with a sharks tooth, was found in 2014 on a 500,000-year-old fossil of a clam found in Java in the 1890s associated with Homo Erectus. 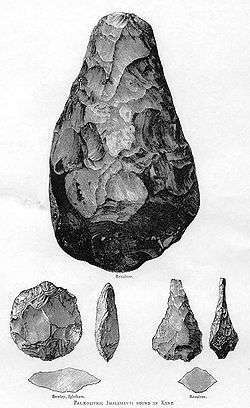 Acheulean hand-axes from Kent. The types shown are (clockwise from top) cordate, ficron and ovate. Homo erectus had long before produced seemingly aimless patterns on artifacts such as is those found at Bilzingsleben in Thuringia, and these might be understood as a precursor to art, as well as to reveal some intent of the artificer to decorate and fashion beyond practical necessity. The symmetry and attention given to the shape of a tool has led authors to see Acheulean hand axes and especially laurel points as artistic expressions. The Mask of La Roche-Cotard has also been taken as evidence of Neanderthal figurative art, although in a period post-dating their contact with Homo sapiens. Similarly, the "Divje Babe flute" has controversially been claimed as a Neanderthal musical instrument dating to about 43,000 years ago. There are other claims of Lower Paleolithic sculpture, dubbed the "Venus of Tan-Tan" (before 300 kya) and the "Venus of Berekhat Ram" (250 kya). Both objects may be natural rock formations with an incidental likeness to the human form, but some scholars have suggested that they exhibit traces of pigments or carving intended to further accentuate the human-like form. In 2002 in Blombos cave, situated in South Africa, ochre stones were discovered engraved with grid or cross-hatch patterns, dated to some 70,000 years ago. This suggested to some researchers that early Homo sapiens were capable of abstraction and production of abstract art or symbolic art. Also discovered at the Blombos cave were shell beads, also dating to c. 70,000 years ago. In 2011, the cave surrendered containers which may have held paints, along with other art supplies, dating to c. 100,000 years ago. Several archaeologists including Richard Klein of Stanford are hesitant to accept the Blombos caves as the first example of actual art. 1 2 "In African Cave, Signs of an Ancient Paint Factory". The New York Times. 2011-10-13. ↑ National Science Foundation "bbcochre2000". Retrieved 2010-10-30.